via Phnom Penh Post, 05 December 2018: Last week the International Coordinating Committee for Safeguarding Angkor, which meets twice a year, celebrated its 25th anniversary. The International Coordinating Committee for the Safeguarding and Development of the Historic Site of Angkor (ICC-Angkor) kicked off its two-day plenary sessions in Siem Reap on Tuesday to mark the 25th anniversary of its formation and its 31st technical session. Prime Minister Hun Sen, who attended the opening session, said preserving cultural heritage should not be mixed with politics. The high-level commemoration was also attended by Unesco director-general Audrey Azoulay, who was visiting Cambodia for the first time, and diplomats from Japan and France. King Norodom Sihamoni was scheduled to close the session. Minister of Culture and Fine Arts Phoeurng Sackona opened the session saying: “Now, Angkor World Heritage doesn’t face insecurity, temple collapses, or looting of antiquities. Borobudur is not 200 years of course, but this year is the anniversary of its ‘discovery’ by Sir Thomas Stanford Raffles. The celebrate this bicentenary, postage stamps have been issued. The BBC has an article about the discovery of the Hobbit, announced 10 years ago, and recaps what the find means for what we know about human evolution. The Hue Relic Conservation Center celebrated 30 years of operation with a ceremony over the weekend. In 1511 the Portuguese led by Alfonso de Albequerque captured the city of Malacca, signalling the fall of the Malacca Sultanate and the first foothold of Europeans into Southeast Asia. 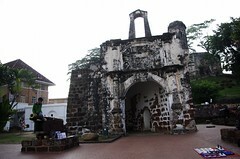 This feature from The Star of Malaysia commemorates the capture of Malacca 500 years ago. Cambodia celebrates the 2nd anniversary of the listing of Preah Vihear temple as a World Heritage Site. The listing of the temple, which borders Thailand was, and still is, a point of contention between Thailand and Cambodia because the borders between the two countries in the vicinity of the temple have not been fixed.